Loyal customers are the life force of any successful business, which is why for any business to rise high and win appreciation, it’s important to carefully foster relationships with customers. Sometimes, however, you simply cannot do so without the help of advanced organizational technologies. Over time, the amount of customer data that you need to keep track of may be too much for a simple spreadsheet, and opportunities for success may start passing by you. This is when a Customer Relationship Management system (or CRM system) becomes the necessity. In a nutshell, a CRM system is an app that allows you to store, organize, and maintain customer contact information, accounts, leads, sales opportunities, and so on – preferably in the cloud so all this vital data is accessible by the sales, marketing, finance, operations, and logistics departments of your company in real time, on any device. Such cloud CRMs are also known as SaaS CRMs, online CRMs, or web CRMs. For a small business, a web-based management solution may be restricted to simply collecting customer data in the cloud and analyzing performance. But as your business grows, CRM software can quickly expand to include more advanced features ‒ built-in marketing automation, project management modules, issue tracking parts – to keep everything under one roof. Today we’re going to talk about how to build a cloud-based customer relationship management system. We’ve carefully analyzed several of the most popular cloud-based CRM apps – Salesforce, SugarCRM, Pipedrive, Insightly (the freshest), and some other open-source solutions – and have come up with a set of must-have CRM system features, which will be helpful if you decided to develop an online CRM for a small business. Let’s see what these features are and how we can implement them. What is the central feature of any CRM software? Of course, it’s an address book. Without one, how are you going to collect all the contacts that may come in handy someday? With an address book, you can store all vital information on your prospects and other people who matter to your business – for instance, the CEO of your partner company and the contractor who works at your office. A person’s full name, email address, and links to social networks can be conveniently gathered and stored in one place so anyone can access it if needed. Traditionally, new contacts are added to a system manually, but most modern CRM apps can now do this automatically. Salesflare, for example, gathers contact information from email signatures and social profiles. Some companies even build custom APIs that let them automatically drop every new contact into a system (this drop is usually initiated when a prospective client fills out a contact form on the company’s website). What about existing contacts? You can also give your users the opportunity to import their contacts from other sources or CRM systems. Insightly, for example, lets users import contacts from Gmail and MailChimp accounts or from Excel files; Pipedrive even lets users import existing contacts from other systems like Zoho and Sugar CRM. As it typically happens, you start tracking your potential customers as “leads,” add some customer information while you’re convincing them that your product or service is worth trying, and finally turn these leads into “deals.” A really effective CRM system should accompany you at every stage of this process, and so your future product should obviously have a place where users can see all of their leads and track their leads’ movements through the sales pipeline – from the first contact to signing a contract. After all, business is business, and helping to move the needle in your sales is actually why CRM systems are built. Applications like Salesflare and Pipedrive use special board-like interfaces that allow you to see how many deals your company currently has, understand at which stage of the sales pipeline these deals are, and see which of them need your urgent attention. Moreover, these applications let users customize their pipelines to meet the specific business needs of their companies: set as many stages as needed, name them, order them, and so on. 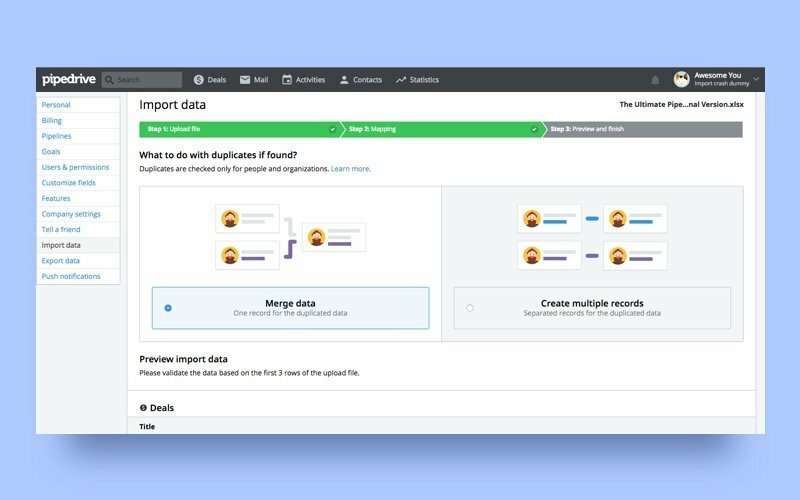 You should also let your users import their leads from existing CSV files or other third-party sources (MailChimp, for example) just as with contacts. Salespeople know that it’s very important not to lose even minor details while working with prospective clients. Many existing CRM apps have a range of tools that help you remember everything that was said and done during your last conversation with a client. Pipedrive, for example, lets you take notes and upload files from your device so you can have everything you need conveniently filed in one record. You can also give your users the opportunity to upload files from Google Drive, Dropbox, Amazon S3, and other cloud storage services. Insightly even provides seamless integration with Evernote, so users can link their Evernote items directly to contacts or deals. Some software, like SalesForce, also provide so-called “smart” BCC functionality. Thanks to this feature, users can copy their emails (sent from external email applications) right to a contact or lead record in Salesforce. Simply enter your Salesforce email address in the BCC field and the email copy will appear inside the application so you can then link it to a certain deal record. Pipedrive provides similar functionality. 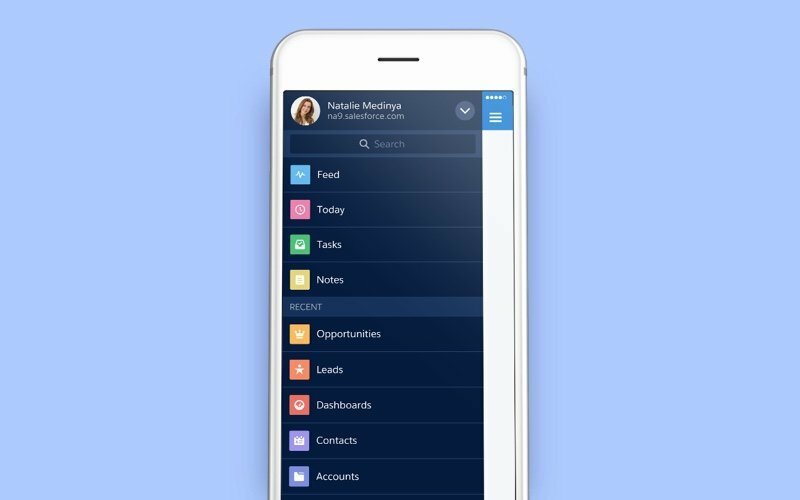 Many existing solutions provide built-in scheduling tools that allow users to set reminders for recurring activities and upcoming events, such as calls, follow-ups, and meetings. This way you can make sure that you don’t miss anything important. Pipedrive, for example, allows you to plan your own activities and assign activities to others. The application provides a special dashboard where you can overview the to-do list for your entire sales department. Insightly uses a different approach to displaying planned events and activities, using a calendar-like board that gives you valuable insights into your sales department’s to-do’s and processes. 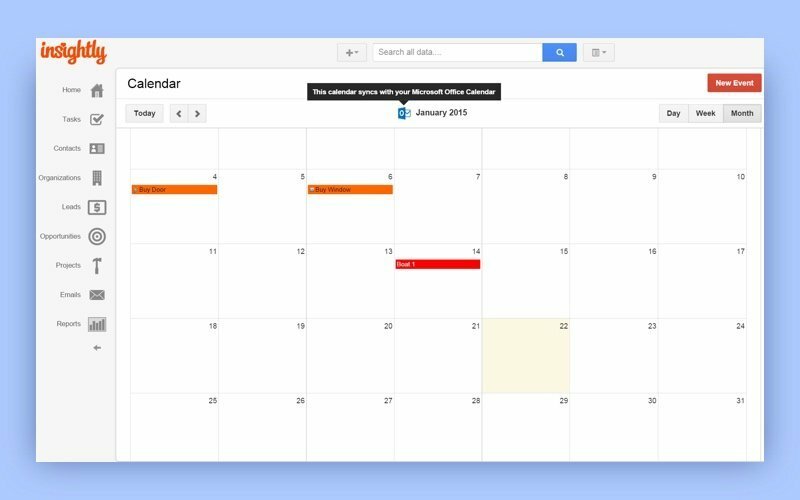 You can even sync the Insightly calendar with Google Calendar so all your planned activities can smoothly mirrored on another platform without your having to lift a finger. There are a number of APIs that allow you to integrate your app with calendar functionality, including the most popular ones like Google’s Calendar REST API, the Eventful API, and Microsoft’s Outlook Calendar API. Your users may want to be notified when important milestones have been achieved, big tasks have been completed, or important activities have been scheduled. Insightly offers special email notifications that are sent when changes or updates are made to tasks or deals. This approach helps users stay up to date on what matters to them. You can also add real-time notifications to your web CRM app, which is an even more convenient approach since users can instantly receive the freshest information on what’s interesting to them without the need to constantly check their mailboxes. Unsurprisingly, support for mobile devices is becoming a must-have for CRM software. To stay on top of the game, modern business people need quick and constant access to their vital data – be it a hot lead’s contact information or the sales statistics for the previous quarter. Immediate access becomes possible thanks to mobile CRM systems. Going mobile provides a greater degree of flexibility and efficiency, which is crucial for the success of any business. Examples of companies that have already gone mobile are Salesforce, Sugar CRM, Insightly, Pipedrive, Base, and Netsuite. Usually, a mobile version of such an application contains all key functions of the web application – such as contacts, leads, tasks, and statistics – and applies some functionalities that are difficult to implement on the web: push notifications, audio recording, call logging, mapping with nearby contacts, and so forth. Which of your products sells best? Who is your most effective sales managers? What’s the average number of deals you close monthly? And, finally, how can you improve your results in the future? Sales analytics and reporting have answers to these and many other sales-related questions. Usually, CRM apps offer dashboards with a number of fields and filters so you can specify a certain time period, channel, and activity and get the data you need. Many apps also let you choose from a variety of view formats: colorful tables, charts, circle diagrams, and so on so you can visualize information the way you want. Some systems also provide the forecasting functionality as a natural continuation of their reporting functionality. A built-in sales forecasting feature can help sales teams accurately predict future sales growth based on their pipeline of current and potential deals. By integrating your CRM system with sales forecasts, sales teams can adjust their selling strategy to achieve better even results. For example, sales managers can make more informed business decisions on how their team should manage its resource and define tasks and deals their employees have to devote their full attention to. Without a doubt, CRM apps are powerful tools to help businesses track valuable information about their leads, log their interactions with them, and convert these leads into deals. For some businesses, however, tracking, logging, and converting is not enough. If these functionalities are no longer sufficient, businesses may start considering adding some marketing automation features to their existing CRM solutions. We can always add a dash of automation to our CRM systems. Using an API, for example, it’s possible to automatically add every new contact when they’ve filled out a form on your website, but marketing automation extensions go a bit further. These tools are tied directly to your website, so they can “stream” new users to a CRM application as soon as they sign up. Moreover, marketing automation tools can monitor your product statistics – where your users come from, which parts of your site they’ve visited, at which point they’ve left, and so on. Having these insights on hand, you can create smart and effective marketing campaigns to nurture your leads. There are a number of companies that offer CRM apps with embedded marketing automation functionalities, including Salesforce, Intercom, Hubspot, and Instant Customer. Sometimes, it may be really costly and time-consuming to develop all necessary features on your own – for example, marketing automation or project management functionalities. That’s why you may start considering integrations with different third-party applications that may significantly save time and money. Besides, this is common practice among popular CRM vendors. Pipedrive provides integrations with more than 20 third-party apps, including famous ones like Trello, Yesware, Callmaker, MailChimp, and Google Apps. Insightly has a number of integrations with popular accounting and productivity tools, but its most compelling integration is with Slack. Insightly’s paid subscribers can enjoy communicating with the lovely Insightly Assistant in the Slack messenger. This chatbot comes in handy if you want to find, create, or update your records in the CRM system without leaving Slack. Of course, these aren’t the only capabilities of Insightly Assistant, but that’s another story. It’s also important to give your users the opportunity to integrate CRM systems with their in-house software (their custom-built accounting and management tools, for example) or perhaps with hardware, such as POS systems. In either case, you’ll need to design an API. APIs enable a seamless exchange of information between applications, which, in turn, enables greater operational consistency and efficiency inside companies. As far as CRM systems keep sensitive company data – customer details, financial data, and more – that’s why it’s very important to give users the security they expect. When developing a CRM solution, you should devote special attention to data encryption, advanced authentication (two-factor authentication), support for different access roles, session timeouts, and other security measures. Each business is unique, and what fits one company doesn't necessarily fit the next. Let users adjust your CRM system to their specific needs. Customization options are advisable when it comes to data presentation, reporting, pipeline stages, deal statuses, as well as different filters and fields. Customization may help you demonstrate that your CRM can meet the needs of all businesses, from brick-and-mortar stores to huge IT corporations.